I’ve been saying it for years, and I’ll keep saying it: we’d all be better off if we worried more about being social, and worried less about doing social media (tweet this). It’s nice to have a new example of this principle in practice. 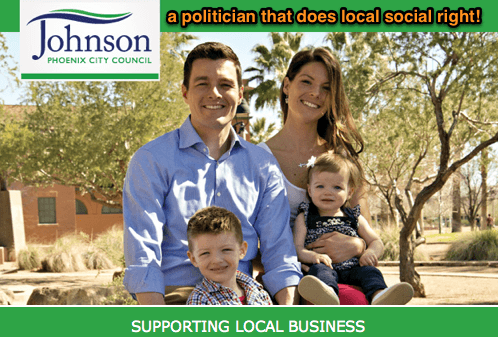 Justin Johnson is a candidate for City Council in Phoenix. He seeks to represent District 4, which is an enclave of historic and gentrified areas, replete with small, interesting businesses. To put his money where his mouth is, he has committed to holding all campaign meetings, donor meetings and other events in local restaurants located in the district. Terrific, right? 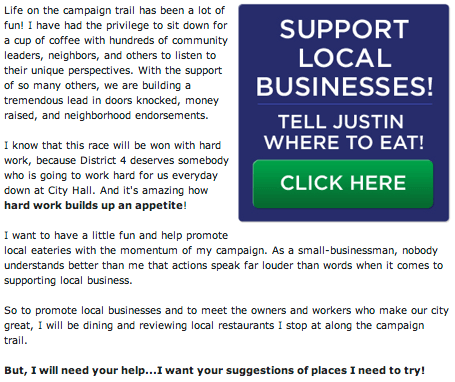 Justin Johnson is partially crowd sourcing his dining locations, asking his supporters for suggestions on where to eat/have meetings, and then is posting reviews of each restaurant on Yelp and his Facebook and Twitter feeds. Armed with suggestions from Phoenicians, the candidate is eating his way through his district, reviewing each stop along the way. This isn’t a particularly complex social media case study, and that’s why I love it. Justin Johnson connects many of the important dots: humanization, local, crowd sourcing, UGC, mobile in one simple program. Bravo! What do you think of Justin Johnson’s initiative?